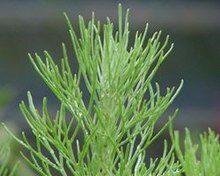 Artemisia /ˌɑrtɨˈmiːziə/ is a large, diverse genus of plants with between 200 and 400 species belonging to the daisy family Asteraceae. Common names for various species in the genus include mugwort, wormwood, andsagebrush. Artemisia comprises hardy herbaceous plants and shrubs, which are known for the powerful chemical constituents in their essential oils. Artemisia species grow in temperate climates of both hemispheres, usually in dry or semiarid habitats. Notable species include A. vulgaris (common mugwort), A. tridentata (big sagebrush), A. annua (sagewort), A. absinthum (wormwood), A. dracunculus (tarragon), and A. abrotanum (southernwood). The leaves of many species are covered with white hairs. Most species have strong aromas and bitter tastes from terpenoids and sesquiterpene lactones, which exist as an adaptation to discourage herbivory. The small flowers are wind-pollinated. 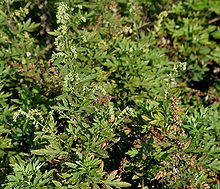 Artemisia species are used as food plants by the larvae of a number of Lepidoptera species. Some botanists split the genus into several genera, but DNA analysis does not support the maintenance of the genera Crossostephium, Filifolium, Neopallasia, Seriphidium, and Sphaeromeria; three other segregate generaStilnolepis, Elachanthemum, and Kaschgaria, are maintained by this evidence. Occasionally, some of the species are called sages, causing confusion with the Salvia sages in the family Lamiaceae. The name “artemisia” ultimately derives from the Greek goddess Artemis (Roman Diana), the namesake of Greek Queens Artemisia I and II. A more specific reference may be to Artemisia II of Caria, a botanist and medical researcher who died in 350 BC. The aromatic leaves of some species are used for flavouring. Most species have an extremely bitter taste. A. dracunculus (tarragon) is widely used as a culinary herb, particularly important in French cuisine. 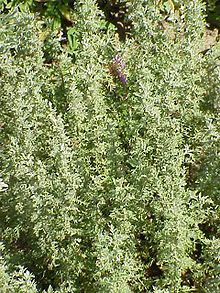 Artemisia absinthium (absinth wormwood) was used to repel fleas and moths, and in brewing (wormwood beer, wormwood wine). The aperitif vermouth (derived from the German word Wermut, “wormwood”) is a wine flavored with aromatic herbs, but originally with wormwood. The highly potent spirits absinthe and Malört also contain wormwood. 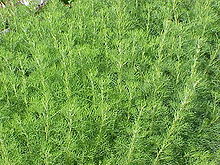 Artemisia arborescens (tree wormwood, or sheeba in Arabic) is a very bitter herb indigenous to the Middle East used in tea, usually with mint. A few species are grown as ornamental plants, the fine-textured ones used for clipped bordering. All grow best in free-draining sandy soil, unfertilized, and in full sun. 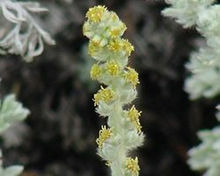 Artemesia stelleriana is known as Dusty Miller, but several other species bear that name, including Jacobaea maritima (syn. Senecio cineraria), Silene coronaria (syn. Lychnis coronaria), and Centaurea cineraria. Artemisinin (from Artemisia annua) and derivatives are a group of compounds with the most rapid action of all current drugs used to treat malaria. Treatments containing an artemisinin derivative (artemisinin-combination therapies) are now standard treatment worldwide for malaria caused by Plasmodium falciparum. In Shakespeare’s Hamlet, the titular character says “Wormwood, wormwood” to comment on the bitter implications of what the Player Queen has just said.